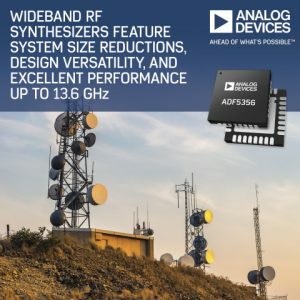 Analog Devices has launched the ADF5356, which is a 13.6 GHz next-generation wideband synthesizer with an integrated voltage-controlled oscillator (VCO). The ADF5356 is well-suited for a variety of applications, including wireless infrastructure, microwave point-to-point links, electronic test and measurement, and satellite terminals. The ADF4356 is a complementary synthesizer product that operates to 6.8 GHz and is comparable in performance. Offer superior PLL figures of merit (FOM), ultra-low VCO phase noise, very low integer-boundary and phase-detector spurs, and high phase-comparison frequency. Phase detector spurious levels are below –85 dBc (typical), and the phase detector comparison frequency can be as high as 125 MHz. Fully supported by the ADIsimPLL, which is Analog Devices’s easy-to-use PLL synthesizer design and simulation tool. 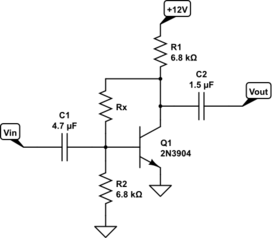 The synthesizers are pin-compatible with Analog Devices’s existing ADF5355 and ADF4355 devices. The ADF5356 costs $39.98 in 1,000-unit quantities. The ADF4356 costs $20.36 in 1,000-piece quantities. 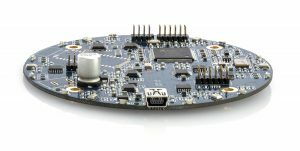 The EV-ADF5356SD1Z pre-release boards cost $450 each. 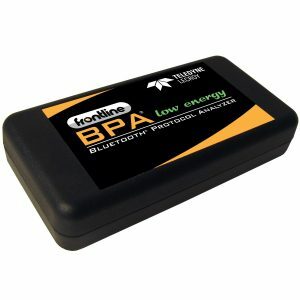 The BPA low energy Bluetooth Protocol Analyzer costs $995. 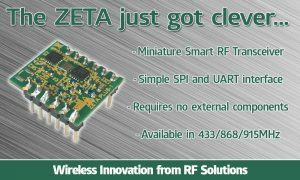 The RF Solutions high-performance ZETA module was recently updated to include a simple SPI and UART interface. The ZETAPLUS module doesn’t require external components, which means a fast and effective plug-and-play setup. Available on 433-, 868-, and 915-MHz frequencies, the module is easy to set up and you’ll be sending and receiving data quickly. Furthermore, you’ll find it easy to create networks of ZETAPLUS modules or point-to-point links without the need for time-consuming register configuration. With an impressive 2-km range, the ZETAPLUS is well-suited for sensor networks, sleepy nodes, and numerous other telemetry, control, and Internet of Things (IoT) applications. Analog Devices recently introduced a real-time Ethernet, multi-protocol (REM) switch chip Ethernet connectivity solution for intelligent factory applications. 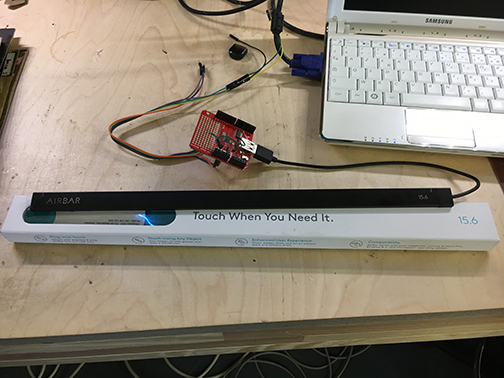 Well suited for a variety of connected motion applications, you can use the “TSN-ready” (time sensitive networking) fido5000 with any processor, any protocol, and any stack. Reduces board size and power consumption while improving Ethernet performance at the node under any network load condition. Supports PROFINET RT/IRT, EtherNet/IP with beacon-based DLR, ModbusTCP, EtherCAT, SERCOS, and POWERLINK. The fido5100 is scheduled for full production in September 2017 and will cost $6 each in 1,000-piece quantities. The fido5200 (EtherCAT Capable) is also scheduled for full production in September 2017 and will cost $8 each in 1,000-piece quantities. 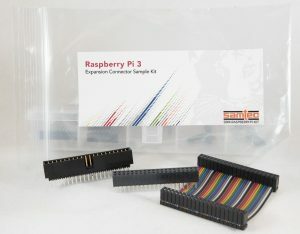 Samtec has announced the release of four unique Expansion Connector Sample Kits for Makers. These new kits allow continued growth and stacking of the most popular electronics platforms using standard 0.100″ (2.54mm) centerline IDC cables, sockets and headers. 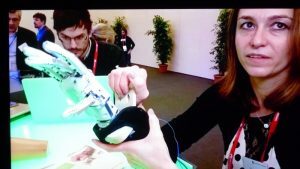 Rapid prototyping of innovative projects using open-source electronic platforms typically requires basic connectors and cable assemblies. 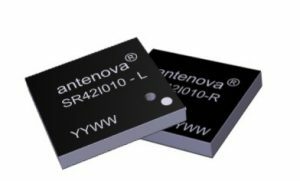 Antenova has announce a new antenna, Grandis, part number SR42I010. It is an SMD antenna that is physically smaller yet provides enhanced performance in the 863-870 MHz and 902-928MHz bands. It directly targets the growing number of M2M and IoT applications using the LPWAN protocols. With Grandis, Antenova has reduced the footprint of the LPWAN antenna to 12.0 x 11.0 x 1.6mm, while also enhancing the antenna’s performance. Grandis is a low-profile antenna which uses a ground plane to radiate, and is designed to be placed in the corner of the PCB. 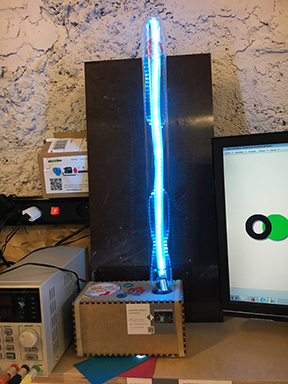 Antenova endeavours to give PCB designers the benefit of flexibility in the positioning of the antenna within a design, so the Grandis antenna is supplied is two versions, Left and Right, to give designers a choice of locations for the antenna on a PCB. 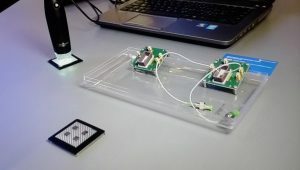 LPWAN is an increasingly popular choice for IoT and smart city applications because it uses less power, which means that the batteries within individual devices will have an extended life. 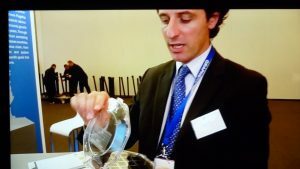 Antenova’s Grandis antenna covers the newer LPWAN standards for connected devices in IoT and smart cities: LoRa, SigFox and Weightless-P. Grandis is suitable for all applications in the 863-870 MHz and 902-928MHz bands, so it could be used in industrial, scientific and medical applications, smart metering, network devices, manufacturing automation, agricultural and environmental monitoring and consumer tracking, worldwide. 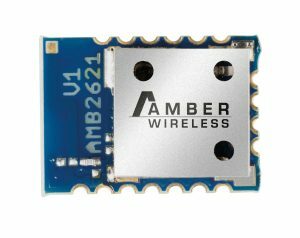 AMBER Wireless’s AMB2621 Bluetooth Smart module is certified for the United States and Canadian markets (Code of Federal Regulations, Title 47, Telecommunication Part 15 – Radio Frequency Devices). Manufacturers that use the wireless module in their products can gain time and cost benefits as a result because they don’t have to have them specifically certified with the Federal Communications Commission (FCC). The certifications for the AMB2621 module demonstrate the following: personal safety isn’t at risk, there’s good immunity against electromagnetic interference, and the radio spectrum is used efficiently. 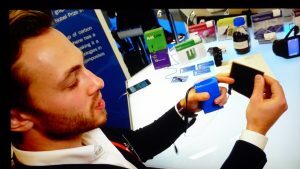 As a result, manufacturers can bring their devices to market quicker and without their own FCC certification. A simple reference on the device label is sufficient (i.e., FCC-ID R7TAMB2621 is integrated). 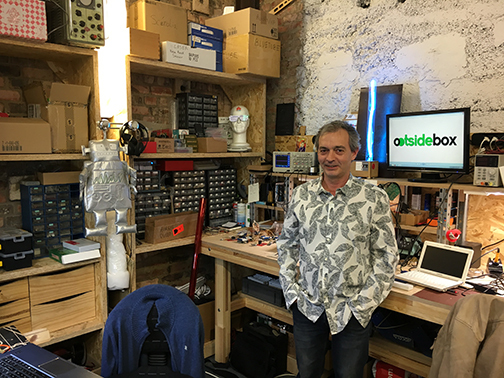 Expands existing products with a BLE interface without having to be adapted in advance.. 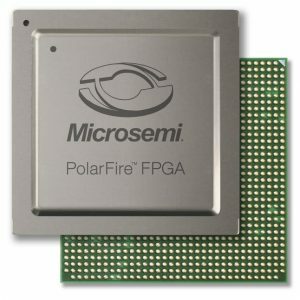 Microchip Technology recently announced a new high-speed network solution for in-vehicle infotainment with device control over Internet Protocol (IP). Unified Centralized Software Stack (UNICENS) is a free software module for anyone using Intelligent Network Interface Controllers (INIC), such as the OS81118, OS81119, and any future INICs. 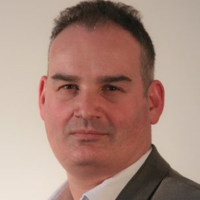 It enables you to focus on application development rather than network management. With UNICENS, you can choose your preferred device control method including Media Oriented Systems Transport (MOST) technology’s FBlock, Ethernet IP and customer-specific methods. It also supports the configuration and control of all network participants from one central node. Furthermore, you don’t need microcontrollers in all the other nodes in the network. 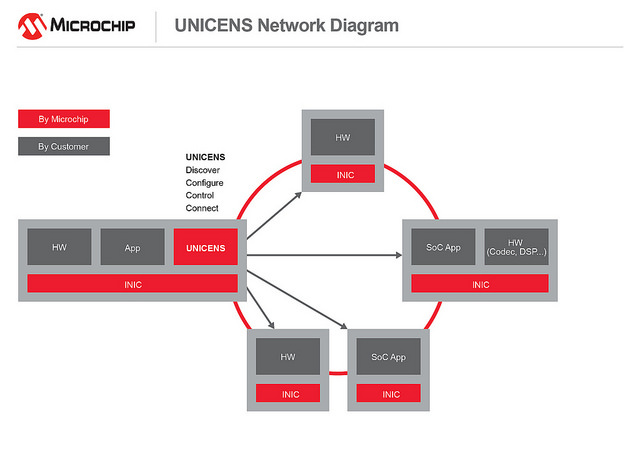 UNICENS is currently available as open-source software for Microchip customers. The 53 mm × 59 mm OSP241-A short-range radar is capable of reporting motion, speed, and direction of objects detected in its wide field of view. 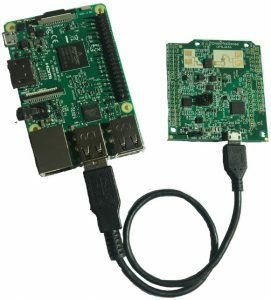 You can plug it into a Raspberry Pi’s USB port to enable a variety of useful applications. An API provides direct control of the OPS241-A and allows for changes to reported units (e.g., meters/second and miles/hour), transmitted power, and other settings. Compared to PIR or ultrasonic sensors, the OPS241-A provides increased range, a wider coverage area, and immunity to noise and light, while providing enhanced information about the detected object. Potential applications range from security motion detection to a radar gun. 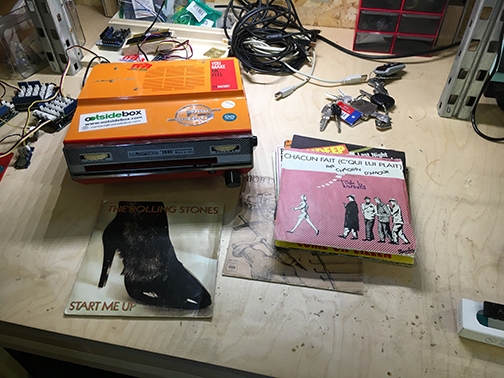 You can plug the OPS241-A directly into an Android phone or tablet running USB OTG and terminal program to turn them into a radar gun. When mounted on a drone, the OPS241-A can detect objects 5 to 10 m away for collision avoidance.